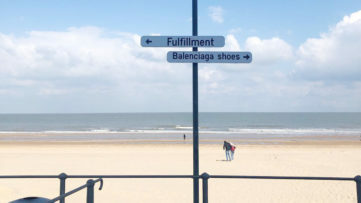 Tthe level of fun here in Ostend keeps increasing, despite the temperature going down. Today I hopped on a bike to have a tour of all the walls being painted right now, but also of those already done by the likes of David Walker, Miss Van, Escif, and Mohamed L’Ghacham. 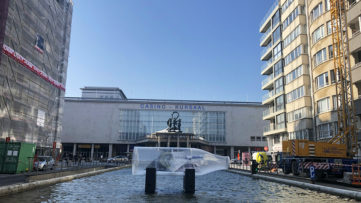 But we’ll keep those a secret until Sunday, as that’s when The Crystal Ship Street Art Festival 2019 ends, and we’ll have a nice recap prepared for you. 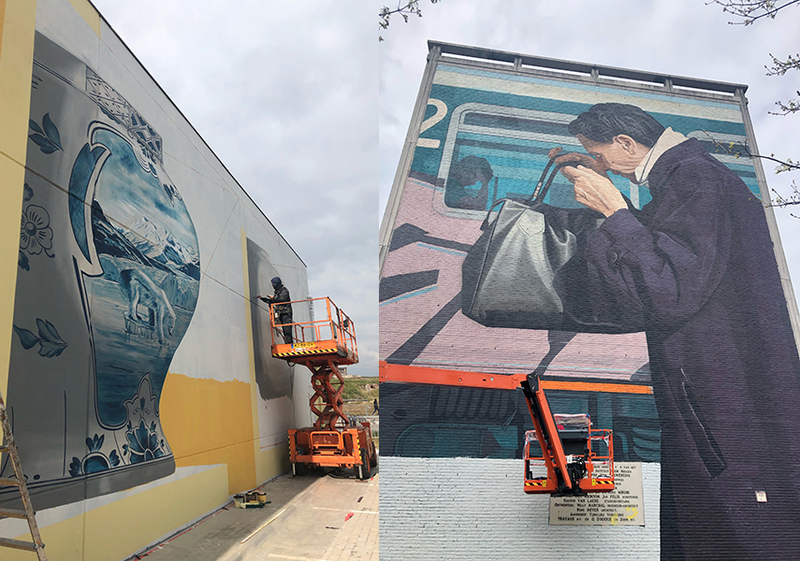 In the meantime, let us take a look at the still-not-finished murals, and Day 2 saw Lonac, Case MaClaim, Paola Delfin and Leon Kerr working hard. You can also check out my impressions from Day 1 here. Around the corner from The Crystal Ship headquarters there was Case Maclaim, who seems to be painting a portrait of an old man. The German artist is quite famous for his photorealistic works, and the one currently being created above Ron’s Pub will definitely have a special flair against the dark bricked wall. 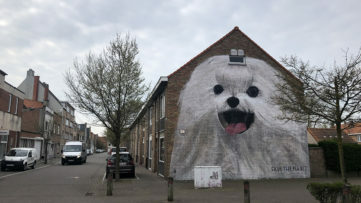 More about this wall in a podcast below! 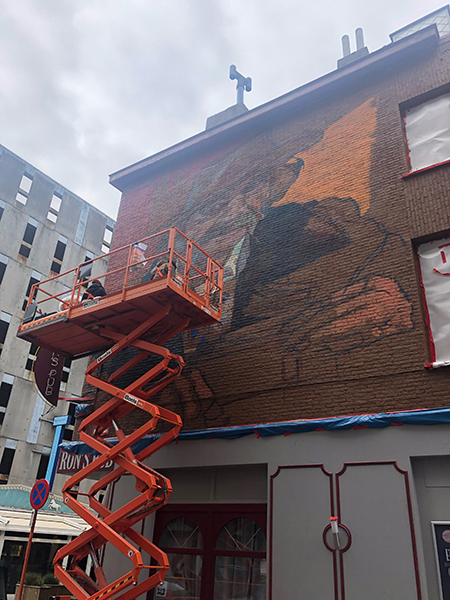 Further one, I bumped into Lonac, who is painting a wall of a building dedicated to one of Ostend’s most favorite people – James Ensor. His portrait however is not related to the artist and, according to Lonac himself, it is a scene from Zagreb, his hometown in Croatia. Next up was Paola Delfin, who is painting what is perhaps the highlight of the The Crystal Ship 2019. 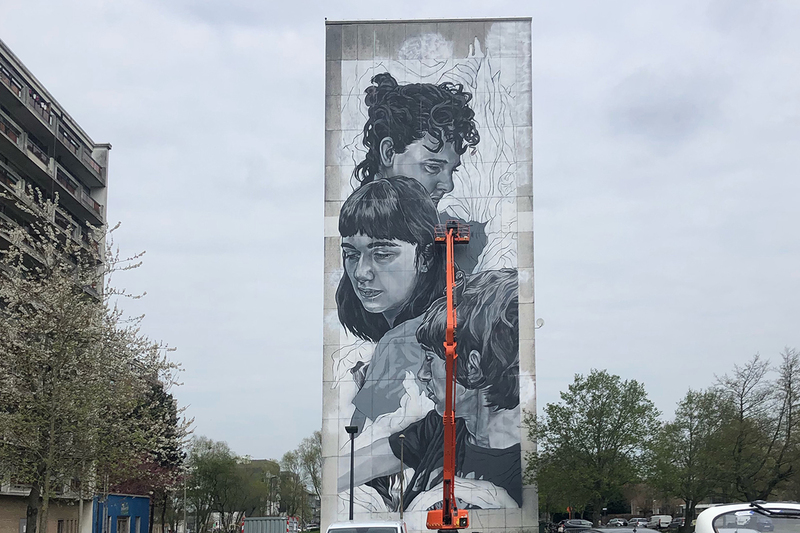 The Mexican artist is covering a 40-meter-tall wall with one of her signature monochromatic portraits, and we’re sure the fact that the official festival opening is due to take place right in front of it tomorrow afternoon is adding some extra pressure. In the mural, you can see The Crystal Ship curator Björn Van Poucke (bottom), the festival’s Artistic Production chief Jasmine Roemendael (middle) and the caretaker of the building that the mural is painted on. Finally, across the canal, we visited Leon Kerr, currently in the process of painting the third out of three vases. It would seem that these are in some way connected to the global warming. As Kerr is one of world’s most famous 3D and 4D street artists, to this artworks as well there is a catch – you need to find the right point of view in order to view the work from the right perspective. In the middle of all the exciting happening at this year’s Crystal Ship, I sat Björn Van Poucke, curator of the festival, down for a chat. He is the man behind many projects having to do with street art, one of them being this event in Ostend, very much worth your visit. Within the festival’s headquarters, we talked about the history of The Crystal Ship and its name – would it surprised you if I said Björn has a strong background in music? – as well as what makes it so unique and what the visitors can expect from this year’s star-studded line-up. We mention the great interventions of the lady artists Helen Bur and Wasted Rita, but also Crystal Wagner. For more podcasts with art professionals, follow Widewalls on Soundcloud! Featured image: Wall in progress by Paola Delfin. All images taken by the author.